Rights campaigners slammed as "appalling" Tuesday the disappearance of dissident publisher Gui Minhai after his daughter revealed he had been snatched again in mainland China, the latest person ensnared in Beijing's crackdown on civil society. Rights have come under increasing pressure since President Xi Jinping took power in 2012, with widespread arrests of lawyers and activists. Gui, a Swedish citizen, was one of five Hong Kong-based booksellers, known for salacious titles about the lives of China's political elite, who went missing in 2015 and resurfaced in detention on the mainland. Chinese authorities said they had released Gui in October, but it was unclear to what extent he was a free man. His daughter Angela Gui told Radio Sweden that since her father's official release from detention, he had been put in a police-managed flat under surveillance. She said that he had then been snatched by plain clothes police on Saturday while on a train to Beijing from the eastern city of Ningbo, where he was living, while accompanied by two Swedish diplomats. Her father had been travelling to Beijing to see a Swedish doctor as he was showing symptoms of the neurological disease ALS -- also known as Lou Gehrig's disease -- she added. "At one of the stops before Beijing there were about 10 men in plain clothes that came in and said they were from the police and just grabbed him and just took him away and after that I have not heard anything," she told Radio Sweden. The New York Times also reported that Gui had been taken in the presence of two Swedish diplomats. The Swedish foreign ministry said it was "fully aware" of what had happened to Gui, without giving further details. Ministry spokesman Patric Nilsson told AFP that "forceful measures have been taken at a high political level". Swedish Foreign Minister Margot Wallström had summoned China's ambassador to a meeting and had been promised information about what had happened to the publisher, Nilsson added. During a regular press briefing, reporters grilled Chinese foreign ministry spokeswoman Hua Chunying about the incident, but she declined to directly address the case, saying she was "not aware of the details" and that the issue was out of the agency's "remit." But, she added, "any foreigner must observe Chinese laws and regulations. This is common sense." She also dodged questions about whether China and Sweden had discussed the case. "Communication channels between China and Sweden are smooth and effective. We can exchange opinions on issues of mutual interest." Rights group Amnesty International described the incident as "absolutely appalling" and called for Gui to be released and allowed to seek medical treatment. The fact that he had been snatched in front of diplomats should be a "wake up call" to the international community, said Amnesty's China researcher William Nee. 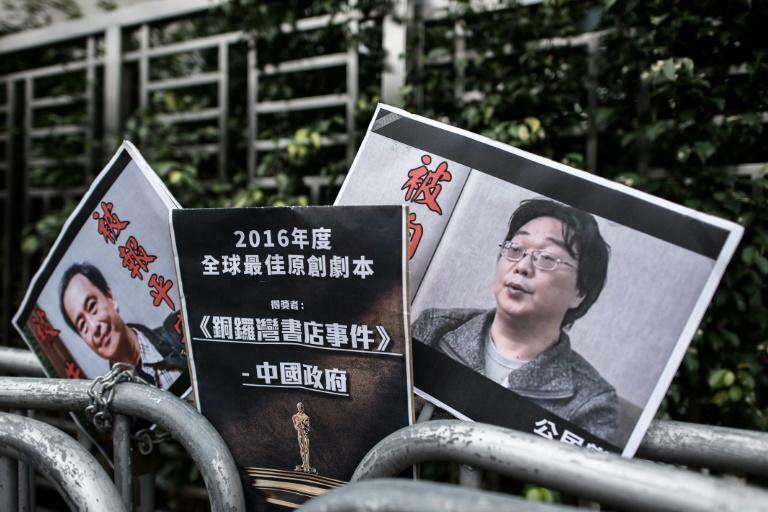 Literary society and activist group PEN Hong Kong expressed "highest concern" over Gui's latest disappearance. "It is now important for foreign governments, particularly the Swedes and the European Union, to respond with strong actions," Human Rights Watch said in a statement to AFP. Chinese authorities were widely criticised after veteran Chinese rights activist and Nobel Laureate Liu Xiaobo died from liver cancer while on medical parole on the mainland in December last year. Rights groups had pushed for him to be allowed to seek medical treatment abroad. Gui first disappeared in 2015 while on holiday in Thailand and was initially detained at an undisclosed location in China. In February 2016 he appeared on Chinese television, weeping as he confessed to involvement in a fatal car accident years before. In another interview the same year, he also admitted trying to smuggle illegal books into China.